Missy Peregrym, Eric Balfour, Jeff Roop et al. Urbanite boyfriend and girlfriend Alex (Jeff Roop) and Jenn (Missy Peregrym) head to the Canadian wild for a romantic getaway. 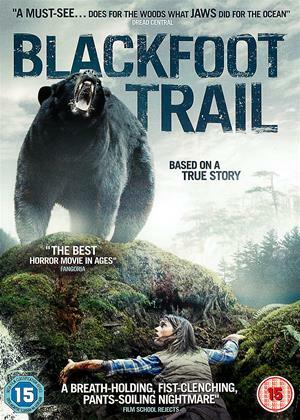 Having visited the woods several times in his life, an overconfident Alex shuns bringing a map or mobile phone and is determined to veer away from the hiking trails into the true wilderness along the secluded Blackfoot Trail. His blind ambition grows stronger when a cocky intruder (Eric Balfour) insinuates Alex is just another soft yuppie pretending to know the area. Before they know it, Alex and Jeff find themselves lost and even worse, they end up stumbling into the hunting grounds of a black bear with a voracious appetite. The other player here is Nicholas Campbell who is great in the small role of the grouchy Ranger-on-the-make. Likeable though Alex seems, it is difficult not to resent him when he ‘reasonably’ insists they continue their trek despite strange noises at night and other unnerving occurrences – we, the audience, know Jenn is bound to be right in wanting to go home, and Alex’s foolhardy refusal to take a map guarantees trouble. We wait a long time for the attacks to come, but when they do, they are expertly handled and very effective. And more gory than we expect. This is an extraordinary debut from writer/director Adam MacDonald and I hope he has a long a fruitful career, because this a film with only four cast members, is extremely easy to enjoy. It should be said, however, that the ending is slightly disappointing, although the atmospheric use of the incredible location – crisp, taught camera angles; at one point, the swaying of the trees has an almost hallucinatory effect – ease the shortcomings due to a lack of proper pay-off. I enjoyed this from start to finish , based on true story of boyfriend and girlfriend go hiking and camping that ends up being a challenge to get back alive. Good thriller.